Starting a fresh set of pages in the second quarter summaries, we find Michigan’s are the next set of volunteer batteries. As mentioned in previous installments, the clerks identified Michigan’s batteries with numbered designations, as per early war convention. But the batteries were later designated with letters within the state’s 1st Light Artillery Regiment. I will merge the two in an attempt to cover all bases. Michigan provided a full light artillery regiment during the war in addition to a handful of independent batteries. The independent batteries were late war formations. 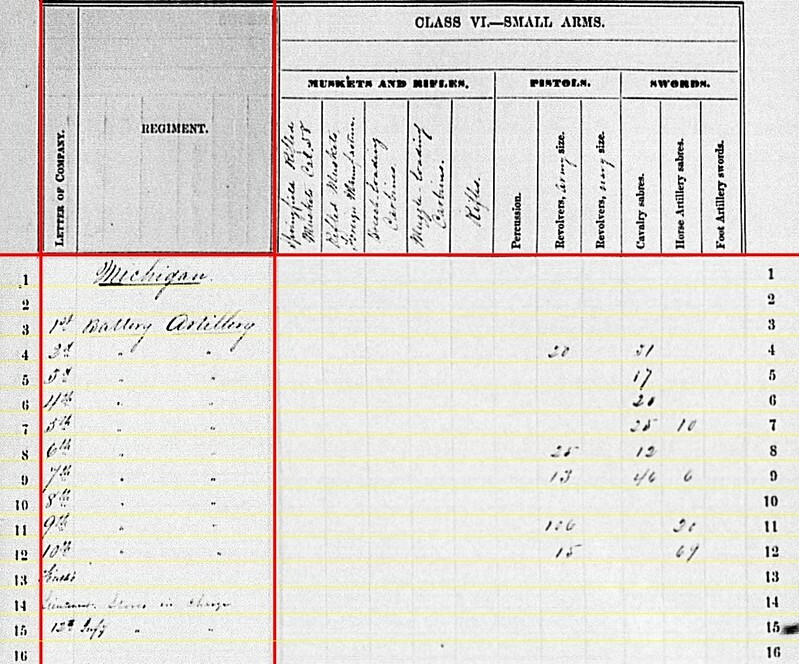 However, all twelve of the 1st Michigan Light Artillery were formed by the end of June, 1863 (just barely, that is). Colonel Cyrus O. Loomis, formerly of 1st Batttery / Battery A, was made colonel of the regiment on October 8, 1862. And Loomis also served as the chief of artillery for Fourteenth Corps, Army of the Cumberland (analogous to the service of Colonel Charles Wainwright in the Army of the Potomac). 1st Battery (Battery A): No return. Also known as the Loomis Battery, for its first commander. At the reporting time, this was Lieutenant George Van Pelt’s battery, assigned to First Division, Fourteenth Corps. Battery reported five 10-pdr Parrotts in an internal report for the Army of the Cumberland. 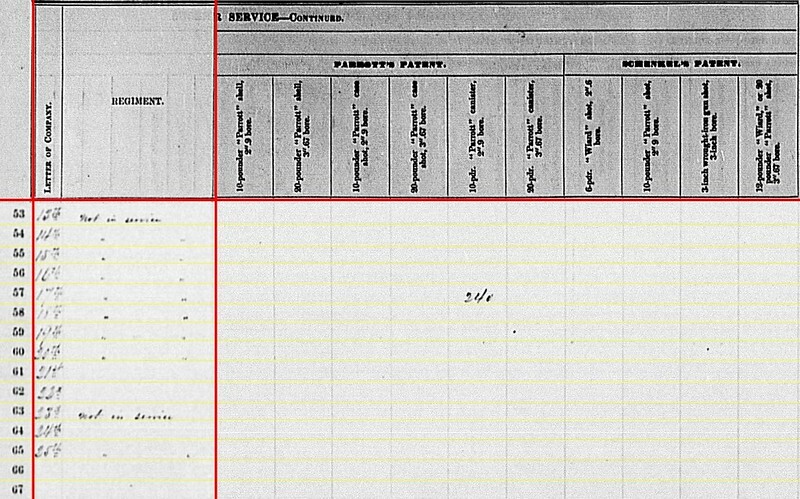 And of course, the battery was part of the Tullahoma Campaign at the reporting date. 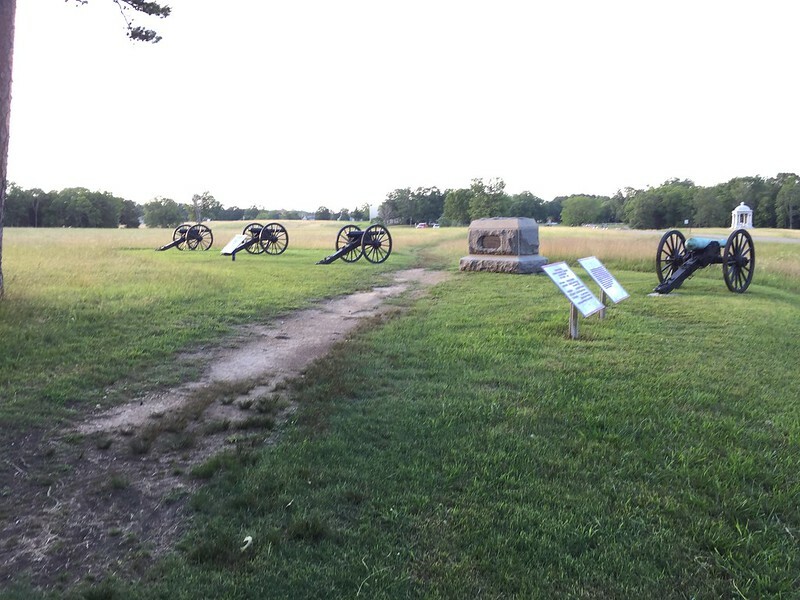 2nd Battery (Battery B): Reporting from Corinth, Tennessee with two 12-pdr howitzers and three 3-inch rifles (under the “steel” column). The battery, under Lieutenant Albert F. R. Arndt, was posted to West Tennessee, under the District of Corinth, Sixteenth Corps. 3rd Battery (Battery C): At Memphis, Tennessee. One 12-pdr field howitzer and three 10-pdr Parrotts. Under Captain George Robinson, this battery was also part of the District of Corinth, Sixteenth Corps. 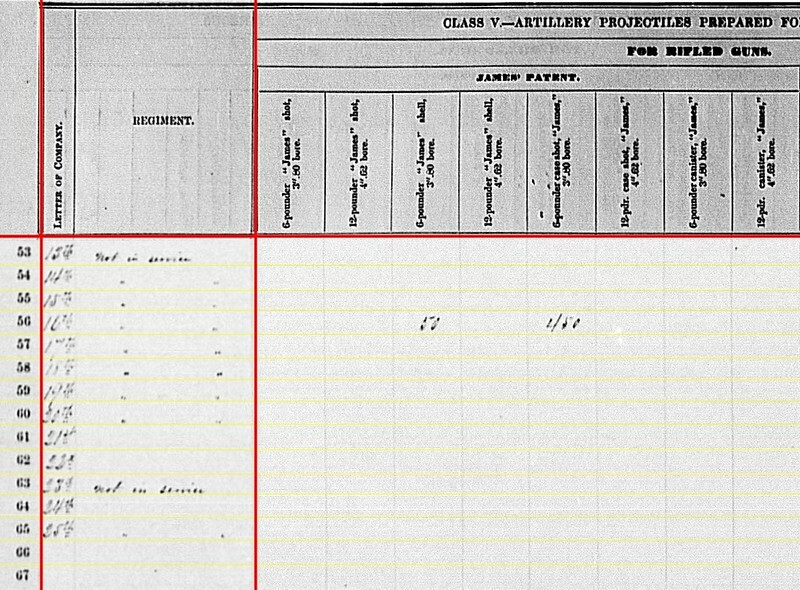 4th Battery (Battery D): Reporting Manchester, Tennessee with two 12-pdr field howitzers, two 10-pdr Parrotts, and two James 3.80-inch rifles. Captain Josiah Church took this battery, assigned to the Third Division, Fourteenth Corps, into action at Hoover’s Gap in late June. 5th Battery (Battery E): At Lavergne (? ), Tennessee with two 6-pdr field guns and four 10-pdr Parrotts. 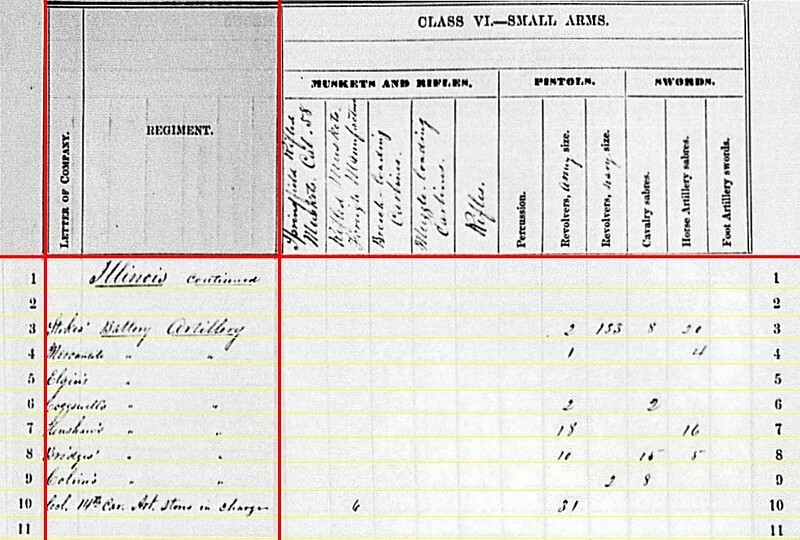 Captain John J. Ely’s battery was part of the Artillery of the Reserve Corps, Army of the Cumberland, and then serving under the garrison of Nashville. The battery was assigned to a post named Fort Riley during this period. 6th Battery (Battery F): Munfordsville, Kentucky with two 6-pdr field guns and two 10-pdr Parrotts. By some reports, the battery had sections at Munfordsville, Bowling Green, and Louisville, through October 1863. Captain Luther F. Hale commanded overall, and at Munfordsville. That section had two 6-pdrs and two Parrotts, in a report to the Department of the Ohio on June 20. Another section at Bowling Green under Lieutenant Byron Paddock also reported two 6-pdrs and two Parrotts. As with the previous quarter, we have to ask if those were duplicate reports? Or if only one section is represented for the summary? Or… one of those sections is carried in the other lines below. 7th Battery (Battery G): At Vicksburg, Mississippi with six 3-inch Ordnance Rifles. The battery was assigned to the Ninth Division, Thirteenth Corps and commanded by Captain Charles H. Lanphere. 8th Battery (Battery H): Also reporting at Vicksburg, but with with two 12-pdr field howitzers, one 6-pdr (3.67-inch) rifles, and two James (3.80-inch) rifles. Captain Samuel De Golyer commanded this battery, assigned to Third Division, Seventeenth Corps, when the Vicksburg Campaign began. On May 25, while directing one of his howitzers, De Golyer was mortally wounded (in the hip). He died later in August. Lieutenant Theodore W. Lockwood assumed command. 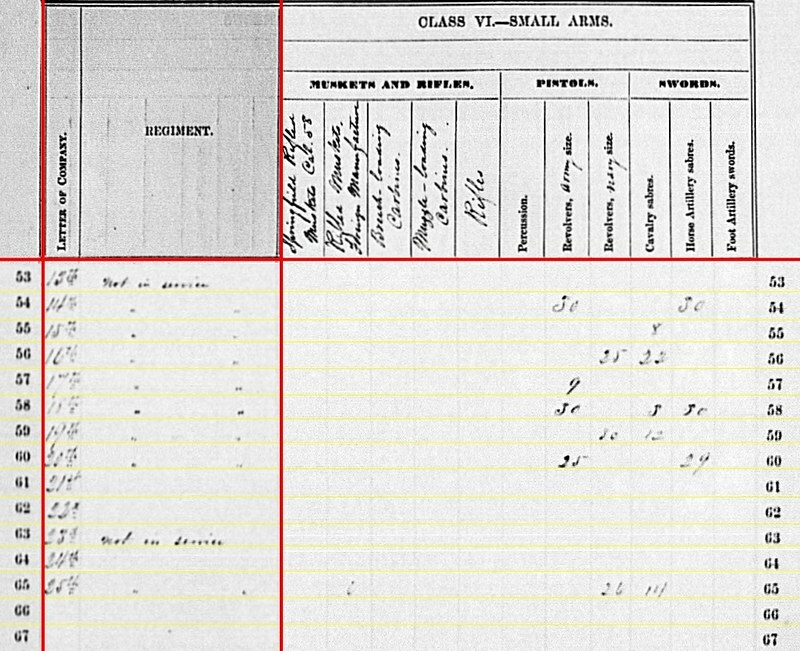 9th Battery (Battery I): Reporting at Boonesboro, Maryland with six 3-inch rifles. Captain Jabez J. Daniels commanded this battery. When Stahel’s Cavalry Division transferred to the Army of the Potomac, Daniels’ battery became part of the 1st Brigade, Horse Artillery, Army of the Potomac. However, the battery was detailed to support First Corps on July 3, and fired 322 rounds of Hotchkiss shot, shell, and canister in the fighting that day at Gettysburg. Their monument is across from the Pennsylvania Memorial. 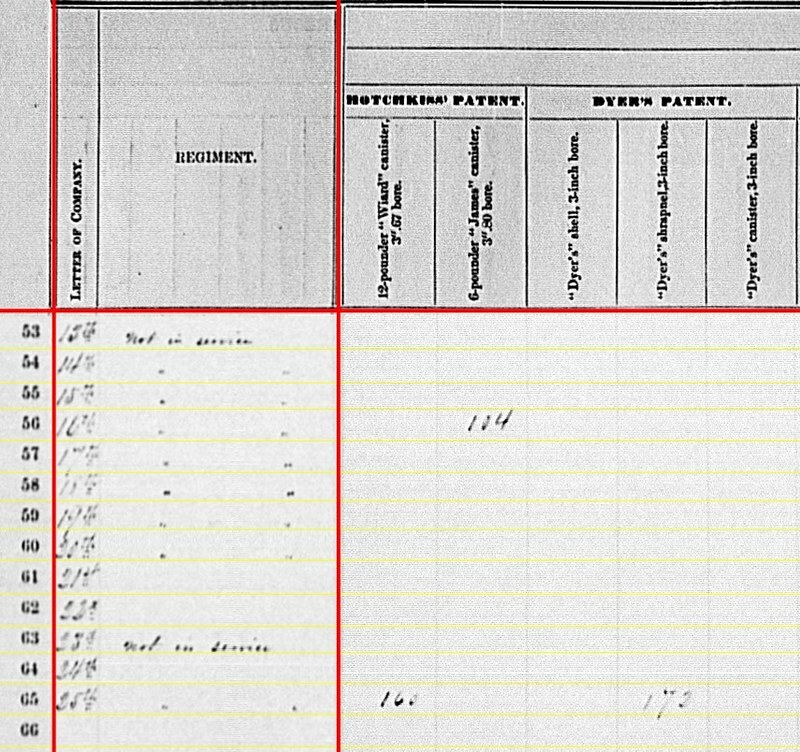 11th Battery (Battery L): Not listed. Under Captain Charles J. Thompson. The battery reported to Cincinnati, Ohio in May. First action on June 15, 1863, at Triplett’s Bridge, Kentucky. And in July, the battery was active against Morgan’s Raid, with one section serving at Buffington’s Island. 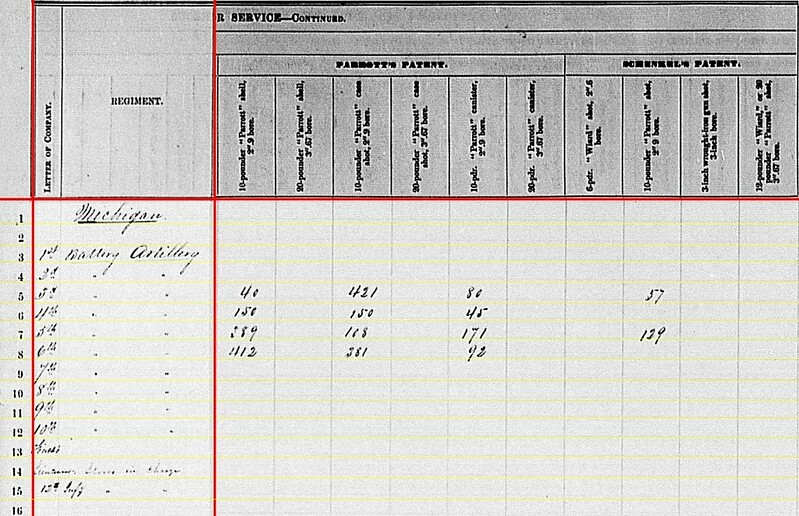 12th Battery (Battery M): Not listed. Captain Edward G. Hillier commanded. The battery did not leave the state until July 9, being dispatched to Indianapolis in reaction to Morgan’s Raid. Finch’s (?) Section: In the previous quarter, we saw Lieutenant Amasa J. Finch, 18th Michigan Infantry, had two field howitzers at Hickman’s Bridge, Kentucky. This was a temporary assignment, apparently disbanded before the end of the March. Though the guns were turned over, the section still reported a handful of implements and tools on hand. “Lieutenant, Stores in Charge”: Reporting from Bowling Green, Kentucky. This line included ammunition (which we will consider below), friction primers, and implements. This line could account for Paddock’s section of 6th Battery / Battery F. And if so, this indicates the section’s guns were accounted for with the main battery summary. 12th Michigan Infantry: At Little Rock, Arkansas with one 12-pdr field howitzer. 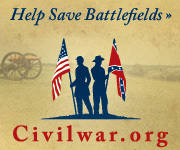 At the end of June, 1863, the 12th Michigan was part of the reinforcements sent from the Sixteenth Corps to Vicksburg, and assigned as part of Kimball’s Provisional Division to the Thirteenth Corps. Later in the summer and fall, the regiment moved with its parent brigade to the other side of the Mississippi, and was part of the force moving on Little Rock. That city fell in November, which is also when the clerks received this return in Washington. Thus explains the location. So with those explanations, we seem to have the blanks covered and important questions answered. 2nd Battery / Battery B: 152 shell, 152 case, and 94 canister for 12-pdr field howitzers. 3rd Battery / Battery C: 80 shell, 80 case, and 35 canister for 12-pdr field howitzers. 4th Battery / Battery D: 98 shell, 108 case, and 40 canister for 12-pdr field howitzers. 5th Battery / Battery E: 206 shot, 133 case, and 137 canister for 6-pdr field guns. 6th Battery / Battery F: 251 shot, 209 case, and 115 canister for 6-pdr field guns. 8th Battery / Battery H: 75 shot and 30 case for 6-pdr field guns; 128 shell, 95 case, and 27 canister for 12-pdr field howitzers. 9th Battery / Battery I: 12 shell for 12-pdr mountain howitzers. Bowling Green: 294 shot, 196 case, and 98 canister for 6-pdr field guns. 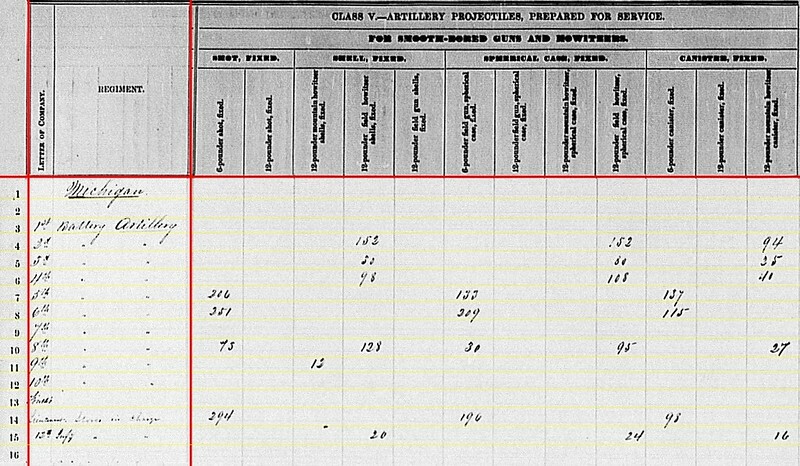 12th Infantry: 20 shell, 24 case, and 16 canister for 12-pdr field howitzers. The first issue to consider is the 8th Battery / Battery H and the 6-pdr ammunition. But that battery also had a rifled 6-pdr field gun, 3.67-inch caliber, which could use smoothbore ammunition in a pinch. More concerning is the 9th Battery / Battery I with mountain howitzer ammunition on hand. I can only speculate. 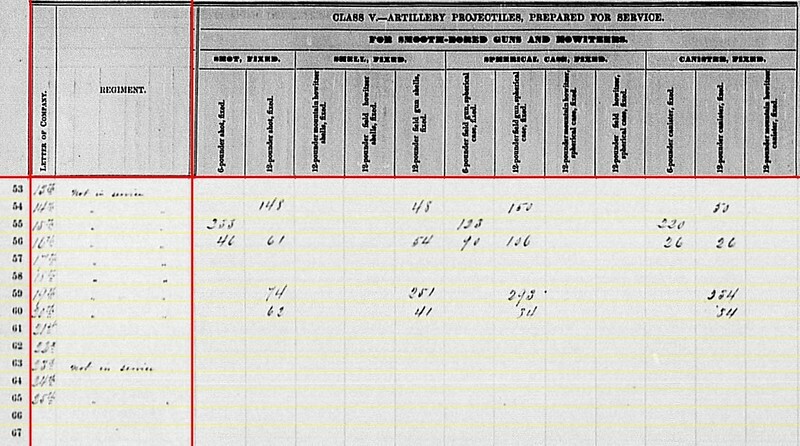 Finally, we see a substantial quantity of rounds at Bowling Green, which might support the idea this was a section from 6th Battery / Battery F.
2nd Battery / Battery B: 240 shot, 48 canister, 48 percussion shell, and 72 fuse shell for 3-inch rifles. 7th Battery / Battery G: 202 canister, 399 fuse shell, and 1,487 bullet shell for 3-inch rifles. 8th Battery / Battery H: 117 shot, 62 percussion shell, and 12 fuse shell for 3.67-inch rifles. 9th Battery / Battery I: 96 canister, 120 percussion shell, 240 fuse shell, and 713 bullet shell for 3-inch rifles. 10th Battery / Battery K: 96 canister, 165 percussion shell, 179 fuse shell, and 402 bullet shell for 3-inch rifles. We have not seen much solid shot for 3-inch rifles reported. So 2nd Battery / Battery B’s report is worthy of notice. However, keep in mind the caliber of projectiles reported by 8th Battery / Battery H. In this case, rifled 6-pdr caliber. 8th Battery / Battery H: 27 canister for 3.80-inch rifles. So, both 3.67-inch and 3.80-inch in the same battery. That 0.13-inch difference? 4th Battery / Battery D: 413 shell, 150 case, and 12 canister for 3.80-inch rifls. 8th Battery / Battery H: 1 shot and 272 shell for 3.80-inch rifles. 3rd Battery / Battery C: 40 shell, 421 case, and 80 canister for 10-pdr Parrott. 4th Battery / Battery D: 150 shell, 150 case, and 45 canister for 10-pdr Parrott. 5th Battery / Battery E: 289 shell, 108 case, and 171 canister for 10-pdr Parrott. 6th Battery / Battery F: 412 shell, 381 case, and 92 canister for 10-pdr Parrott. 3rd Battery / Battery C: 57 shot for 10-pdr Parrott. 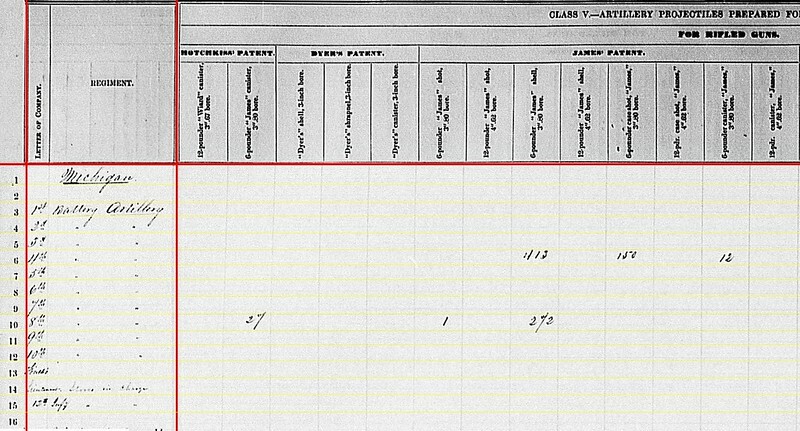 5th Battery / Battery E: 129 shot for 10-pdr Parrott. 5th Battery / Battery E: 40 shell for 10-pdr Parrott. Appears the 10-pdr ammunition chests were well stocked. Lastly, we turn to the small arms. Notice the hand-written column headers here. None of those come into play for the Michigan batteries. But we’ll see those discussed in future installments. 2nd Battery / Battery B: Twenty Army revolvers and 31 cavalry sabers. 3rd Battery / Battery C: Seventeen cavalry sabers. 4th Battery / Battery D: Twenty cavalry sabers. 7th Battery / Battery G: Thirteen Army revolvers, forty-six cavalry sabers, and six horse artillery sabers. 9th Battery / Battery I: 106 Army revolvers and thirty horse artillery sabers. Looking back to the previous quarter, there is some attrition and loss indicated with the small arms. As one might expect with these batteries involved with hard campaigning.